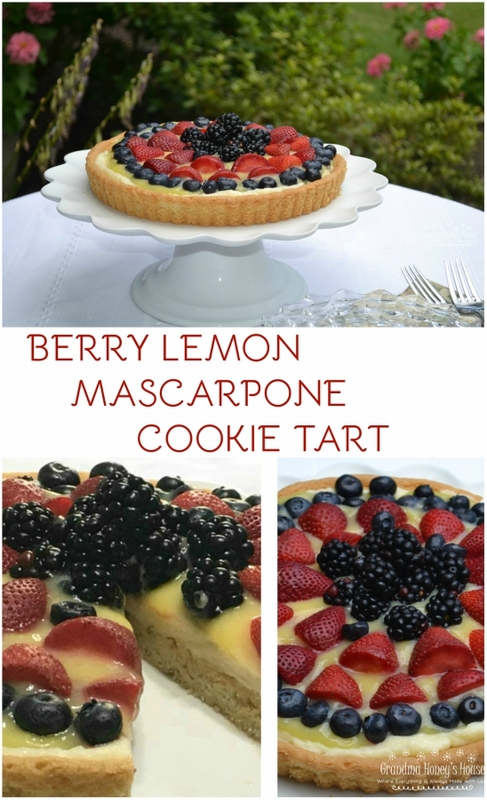 Berry Lemon Mascarpone Cookie Tart is a richly, delicious summer tart. 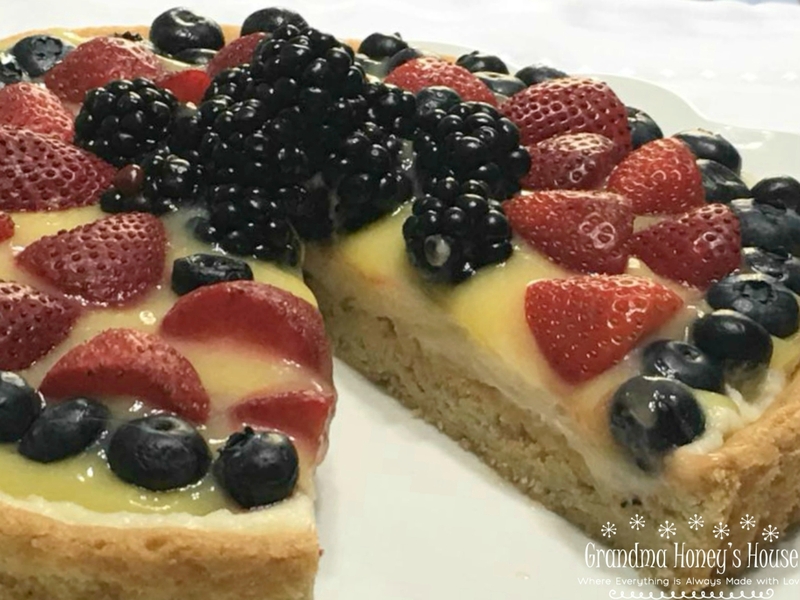 It is created using a refrigerated cookie dough crust that is filled with sweetened mascarpone cheese, homemade lemon curd, and then topped with a variety of fresh fruit. First of all, I have to say that I was so excited to make the lemon curd. I have only used it a few times in my life, and have NEVER made it. It was so easy. I used a recipe that I found on line at All Recipes. HERE is the link. Delicious. 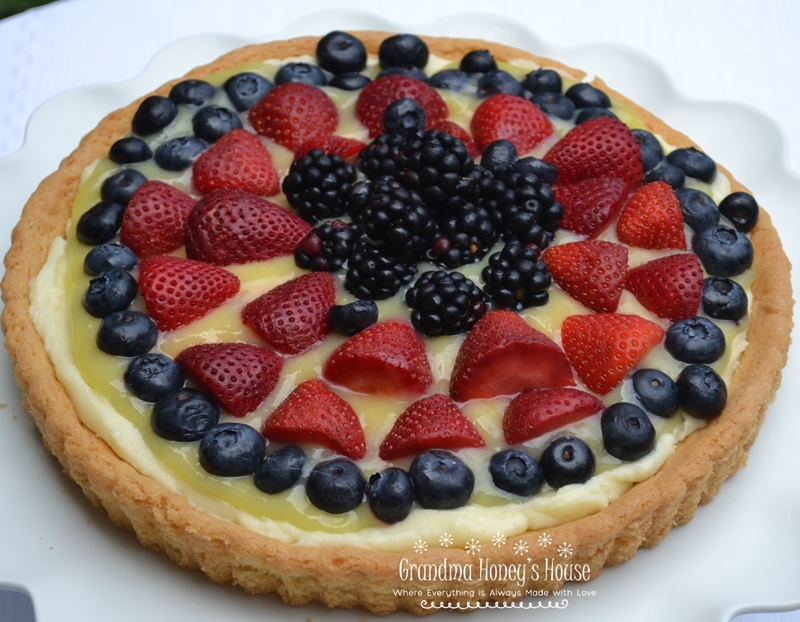 Tarts are one of my favorite desserts to make in the summer. It seems like I am always finding wonderful fresh fruit at the market stands, and this is another way to use it. Remove pan to a cooling rack for about 20 minutes then remove the sides and allow crust to cool on a wire rack. Transfer cooled crust to a serving plate. Beat together the mascarpone cheese, confectioner sugar, and vanilla. Spread into bottom of crust. 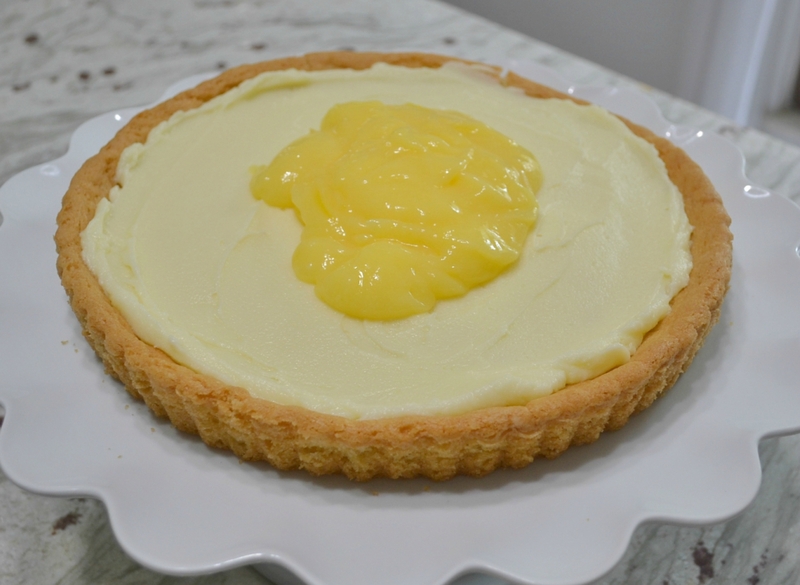 Spread about 1/2 heaping cup of the homemade lemon curd over the mascarpone layer, allowing some of it to show. Arrange any variety of fresh fruit over the top of the lemon curd. Refrigerate until ready to serve. My husband does not like to eat sweets, and he really does not like lemon, but I think this dessert changed his mind. I took it outside after I made it and served him a piece while we were sitting on the porch. He kept saying how delicious it was. He even ate a second piece later in the evening. The crust becomes softer from the fillings after it sets at room temperature for a few minutes, after removing from the refrigerator. 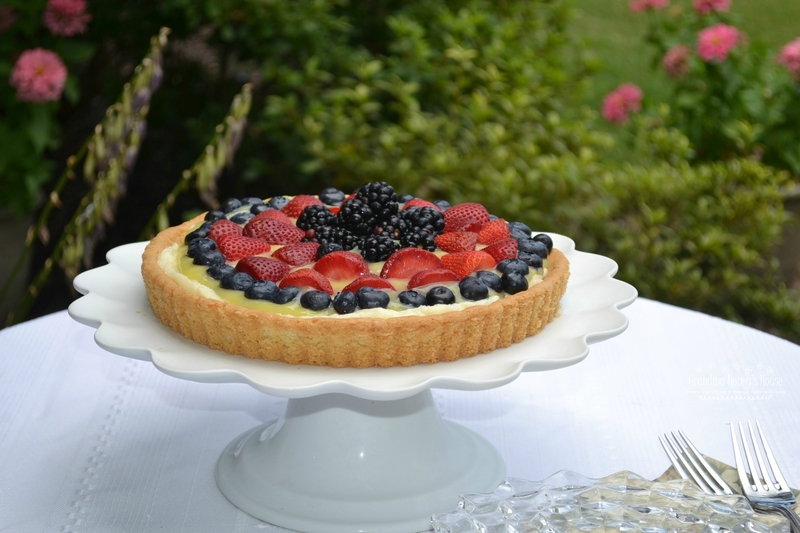 The tart is a perfect blend of flavors. I would suggest serving this dessert the day that it is made. My strawberries were starting to run a little the second day. The other berries remained firm. I would also serve small slices of this tart as it is very rich. Wash berries and set aside to dry. Remove cookie dough from refrigerator to slightly soften at room temperature. 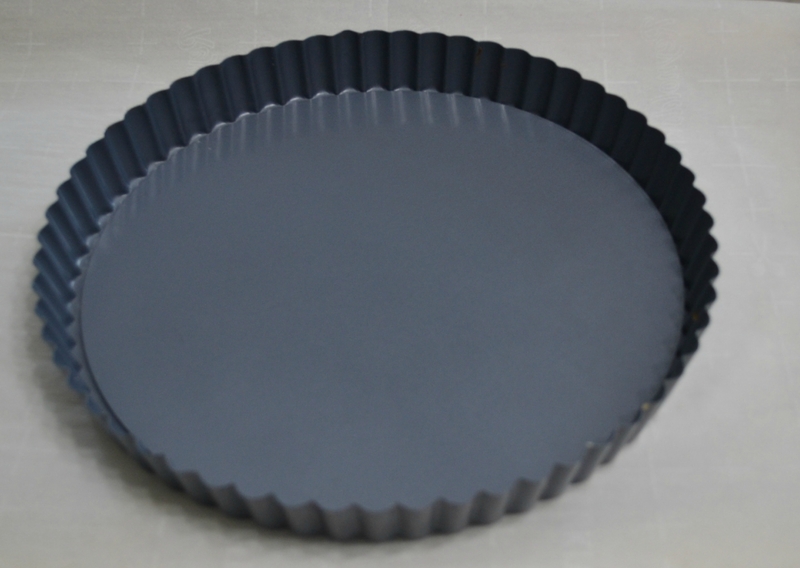 Crumble dough into 9-inch, ungreased, tart pan with removable sides. Press dough into the bottom and up sides 1 1/2 inches. 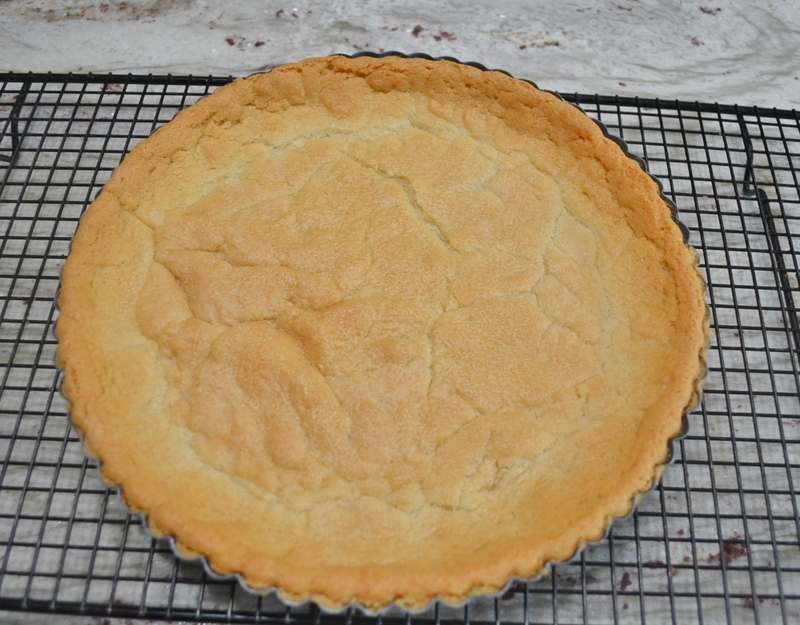 Bake for 15 to 24 minutes, until edges are light golden brown and crust seems set. Remove from oven to a wire cooling rack. Cool completely. Remove sides from pan. May also remove crust from bottom disc of pan. Transfer to a serving plate. In a medium size mixing bowl, using an electric mixer, beat together the mascarpone cheese, confectioner sugar, and vanilla until well combined. Spread into cooled crust. 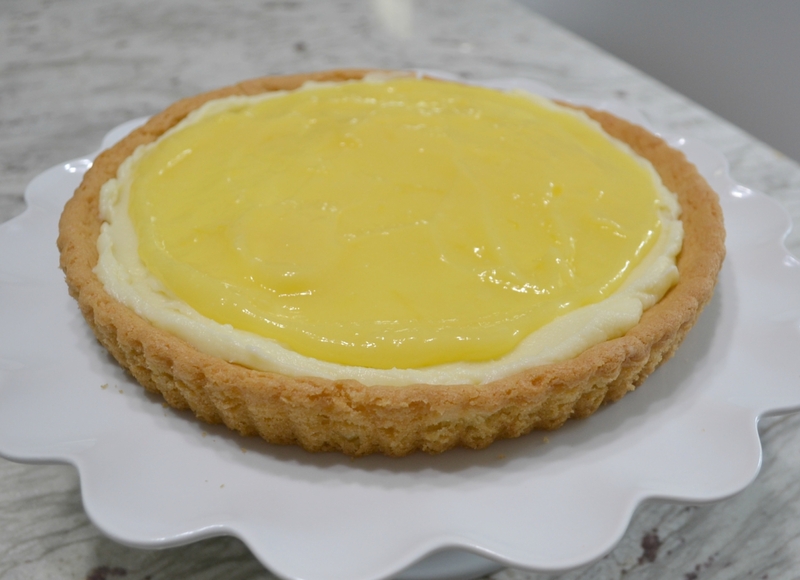 Spoon lemon curd onto center of mascarpone layer and spread evenly. Leave a small edge of the mascarpone showing. Arrange fruits on top of lemon curd. Refrigerate until ready to serve.